In our cover article, Matthew Levitt examines Hezbollah’s procurement channels, documenting how the group has been leveraging an international network of companies and brokers, including Hezbollah operatives and criminal facilitators, to procure weapons, dual-use items, and other equipment for the group and sometimes Iran. Levitt details how in the context of the war in Syria, “some of Hezbollah’s most significant procurement agents—such as Muhammad Qasir—have teamed up with Iran’s Quds Force to develop integrated and efficient weapons procurement and logistics pipelines through Syria and into Lebanon that can be leveraged to greatly expand Hezbollah’s international weapons procurement capabilities.” Levitt reveals Qasir appeared in footage of meetings last month between Syria’s President Assad and Iran’s President Hassan Rouhani and Supreme Leader Ayatollah Khamenei, underscoring the importance Damascus and Tehran attach to Qasir’s efforts. At a time when the international community was focusing on the issue of a series of deadly ‘lone wolf’ attacks across the globe by the Islamic State, ignoring the rise of ‘White Nationalism’ against ‘Islamist invaders’, a white man, identified as Brenton Tarrant, in his late 20s carried out the deadliest attack ever witnessed in New Zealand. 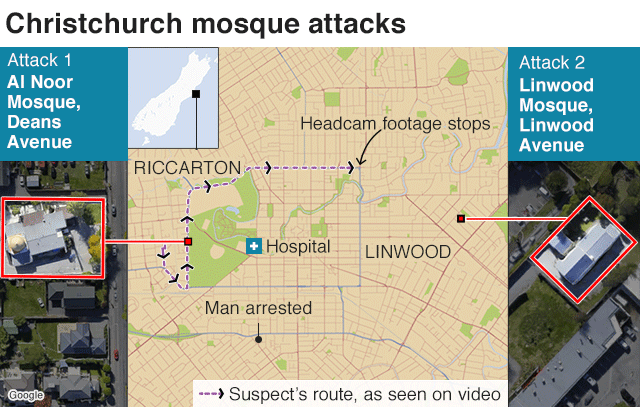 Tarrant killed 49 Muslim worshippers at two separate mosques - Al-Noor Mosque and Linwood Mosque – in Christchurch. New Zealand Police Commissioner Mike Bush confirmed that 41 people were killed at Al-Noor Mosque while another seven were killed at Linwood Mosque. One person died at a hospital. 42 people, including a four-year-old child, were reported injured. Several others, including nine Indian citizens, are missing. New Zealand Prime Minister Jacinda Ardern admitted that “this can now only be described as a terrorist attack". She also noted “it is clear, this is one of New Zealand's darkest days”. New Zealand never before in its history had witnessed a terror attack of this scale. Indeed, as per reports, New Zealand's terror threat level has been lifted to high for the first time in its history, following the attack. On Friday, March 15th, one or more gunmen opened fire in two mosques in Christchurch, New Zealand. As I write this, three men and one woman have been taken into custody by local law enforcement. It is unclear to what extent they were all involved. The only thing we know is that one of the shooters went by the name Brenton Tarrant on Twitter. He posted pictures of the murder weapons there two days before the rampage. Said weapons are clearly visible in the video of the spree he livestreamed to Facebook. 1 First, words have consequences. The demonization of Muslim communities, often by politicians who later act shocked and angry when violence occurs, contributes to societal polarization and inspires violence. Britain’s Boris Johnson offered the traditional “thoughts and prayers” after the attack, but had previously written that women dressed in a burqa look like “bank robbers.” Incredibly, after the shooting, right-wing Australia Senator Fraser Anning claimed,“The real cause of bloodshed on New Zealand streets today is the immigration program which allowed Muslim fanatics to migrate to New Zealand in the first place.” Terrorists feed on this polarization and seek to worsen it. 2 Second, security services and government institutions must prioritize white nationalist and other forms of right-wing terrorism. In the United States, right-wing violence has grown, with Jews and Muslims in particular being targets. The Trump administration has cut programs focusing on right-wing groups even amid a growing threat. Given the recent decline in jihadi violence in the United States, transferring some resources is appropriate. Similarly, ensuring immigrant integration is vital. In contrast to Europe, the American Muslim community regularly cooperates with law enforcement. Ideally, the president would press state and local officials to continue and expand their work with Muslim communities, not just to stop radicalism in their ranks but also to protect them from right-wing extremists. 3 Third, leadership can matter in a crisis, particularly when backed with action. Prime Minister Jacinda Ardern’s immediate declarationabout the Muslim victims—“they are us”—is an excellent beginning and shows how a leader can use a tragedy to bring a reeling country together. To go beyond rhetoric, Ardern should ask New Zealanders to accept more Muslim migrants to show that violence not only fails but will backfire. 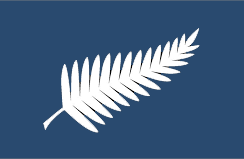 Prior to 1.40pm today, New Zealand had seemed immune from the threats and events affecting the rest of the world, however we have now tragically joined the sad reality of the world's future security environment. For many years New Zealand has held a coveted spot as one of the safest countries in the world. To a great degree, even despite the events of today, this status will remain when compared to the larger security threats facing many other countries. However what many Kiwis forget is that those values of safety, lifestyle and isolation are looked upon favourably by those wishing to do us harm as weakness or vulnerabilities to be exploited. As a nation many have the mindset that it will never happen here. For me the perfect example of that very mindset are reflected in comments made today by a regional mayor when he stated "It is unthinkable in NZ". These comments will, of course, not be limited to him but will have been muttered in stunned disbelief by many. But why should we be at all shocked that this has happened here? For a select few of us constantly monitoring and assessing the global security situation it was never going to be a shock. Despite our hope that we would remain untouched, it was always going to be a matter of when not if. New Zealand has now come to the hard realisation that our beliefs in our geographic location, way of life, global friend to all image and belief that what is happening in the rest of the world does not affect us, were our greatest threats all along. So where does that leave us now? We must of course take time to grieve for those lost and fully comprehend what has happened, but our vigilance and understanding of what our new life looks like moving forward, must start now. While this is hopefully a one-off incident, we cannot assume so. Reality has proven that in our laissez faire environment, it has been easy for individuals to plan a devastating attack that has rocked our society to its core and provided those responsible with global coverage of their crimes. A new resolution introduced in the House by Rep. Jim Banks (R-Ind.) 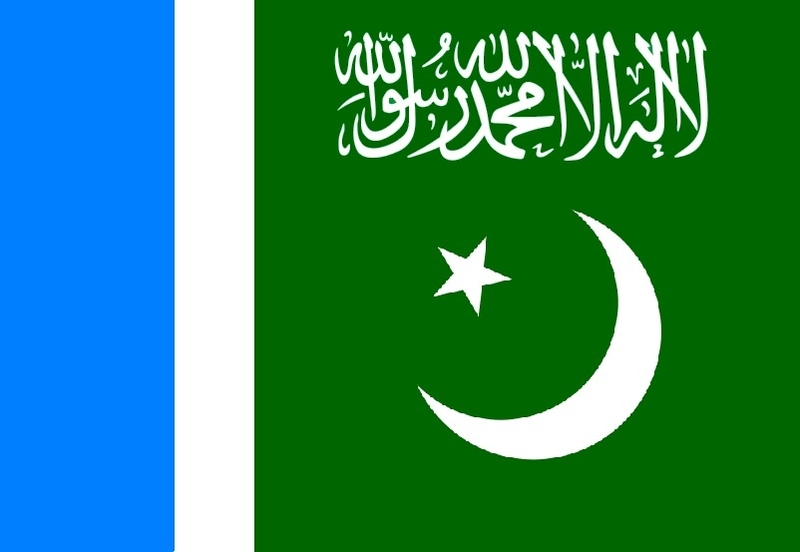 demands an end to U.S. government funding for Jamaat's U.S. proxies and calls for a criminal investigation into links between a prominent American Jamaati charity and one of Pakistan's most prominent terrorist movements. In 2014, Jane's Terrorism and Insurgency Centre from IHS Markit named Jamaat's student wing in Bangladesh, Islami Chhatra Shibir, the third-most violent non-state armed group in the world. In 2017, the U.S. government designated the head of a Jamaat affiliate in Pakistan and Kashmir a "global terrorist." And over the past few months, Jamaat gained international attention after its supporters rallied for the killing of Asia Bibi, a Christian woman accused of blasphemy. A Department of Defense (DoD) branch that “identifies and develops capabilities to combat terrorism and irregular adversaries” is looking for big ideas. According to a solicitation issued earlier this year, DoD’s Combating Terrorism Technical Support Office (CTTSO) wants scientists and researchers to deliver, among other things, adhesive skin patches that double as alarms; color night vision; armed underwater drones; long-range facial recognition; and a device that can locate and identify human targets through solid walls. CTTSO’s request represents a “wish list” of sorts, says Paul Rosenzweig, a former deputy assistant secretary for policy at the Department of Homeland Security who has written extensively about counterterrorism. Now a senior fellow at the R Street Institute, a conservative-leaning Washington, DC think tank, Rosenzweig thinks some of what CTTSO hopes to achieve is likely doable, and reasonably quickly. Certain concepts, however, will probably remain just slightly out of reach, at least in the near-term, Rosenzweig tells Quartz. Researchers examined past U.S. countering violent extremism and terrorism prevention efforts and explored policy options to strengthen terrorism prevention in the future. This document summarizes findings from the main report, including that current terrorism prevention capabilities are relatively limited and that there is a need for federal efforts to help strengthen local capacity. However, any federal efforts will need to build community trust to be successful. The recent history of the United States and Western allies working “by, with, and though” non-state actors for counterterrorism (CT) operations when unable or unwilling to partner with a host-nation government—such as in Mali, Libya, and Syria—has generated mixed results on the ground. Militias can provide a ready-made local ground force willing to fight capable terrorists but lack the legitimacy, effectiveness, and staying power to hold and sustain military gains. Conducting CT campaigns by empowering non-state proxies poses unique dilemmas and policy trade-offs for Western policymakers, with limited options to secure swift CT wins without stoking local conflict and generating instability resilient terrorists can exploit. The proxy approach will likely remain appealing to Western countries as well as great power rivals as low-cost means to reduce exigent terrorist threats and pursue their security and strategic interests vis-à-vis competitors. The January issue focuses on an overview of the terrorist and violent extremist threats in key countries and conflict zones in the Asia-Pacific throughout 2018. The articles discuss the regional terrorism threat and responses in Southeast Asia, South Asia, Central Asia, China and the Middle East. 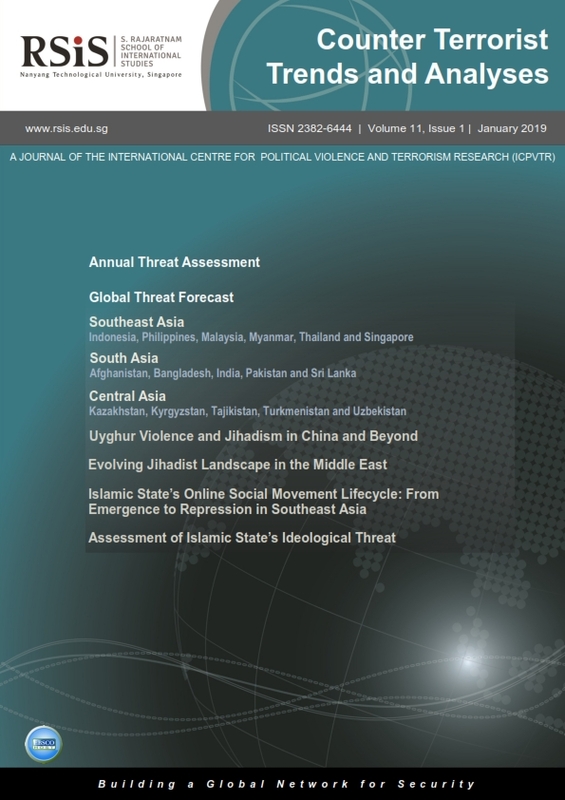 Thematically, the articles also analyse online extremism and the counter-ideology dimensions of terrorism and violent extremism in 2019. The lead article argues that global terrorist and extremist threat is likely to persist in 2019 as the Islamic State (IS) is going through a phase of readaptation and decentralisation. The group has established clandestine and underground structures to survive in Iraq and Syria. Its ideology is still intact and continues to be propagated in the cyber space. In the provinces, groups, networks and cells which have pledged allegiance to IS leader Abu Bakr al Baghdadi are radicalising Muslims and conducting attacks. Harnessing both the physical and virtual space, IS continues to present an enduring threat worldwide. Although the apex of IS leadership and many of the directing figures are on the run and might be eliminated in 2019, the penultimate leadership enabling the fight and supporting the infrastructure will continue to operate in the shadows as they become agile and more cunning. The IS and Al-Qaeda (AQ)-centric threats are likely to remain given the lack of an effective global counter terrorism plan and strategy, the continuation of superpower and geopolitical rivalry, and the failure to resolve the underlying causes of extremism and terrorism. Thus far the chief purpose of our military establishment has been to win wars,” the American nuclear strategist Bernard Brodie wrote in 1946. “From now on its chief purpose must be to avert them.” Brodie’s injunction summed up the grim lesson of the first five decades of the twentieth century: after two horrific world wars and the development of nuclear weapons, it was clear that the next major conflict would produce no winners—only survivors. As U.S. President John F. Kennedy put it a decade and a half later, in the midst of the Cuban missile crisis, “Even the fruits of victory would be ashes in our mouth.” For decades, U.S. policymakers followed Brodie’s and Kennedy’s lead, putting deterrence—preventing rivals from attacking in the first place—at the center of U.S. defense strategy. Applied effectively, deterrence discourages an adversary from pursuing an undesirable action. It works by changing the adversary’s calculation of costs, benefits, and risks. A country can, for instance, convince its opponents that an attack is so unlikely to succeed that it is not even worth the attempt: deterrence through denial. Or a country may convince its opponents that defeating it would be so costly as to be a victory in name only: deterrence through punishment. In either case, a rational adversary will decide to stay put. Resurgent Al-Qaeda Planning New Series Of Spectacular Attacks Against Airliners And Airports, Including Drone Strikes And Suicide Passengers, Warns U.S. Security Minister; After Gatwick Airport Incident — Will Drones Become The New Improvised Explosive Devices (IEDs)? Just in time for Christmas. Leave it to the darker angels of our nature and the pathetic — the militant Islamists — to keep coming back like a bad hangover. I have written for the past several years that it is ‘easy’ to kill a person; but an idea/philosophy….not so much. I have repeatedly argued that the world needs a 21st century version of the Nuremberg War Crimes trials and put militant Islam on trial — much as we did Nazism in the immediate aftermath of WWII. Just as the Nuremberg War Crimes trials exposed the world to the true evil that Nazism comprised, and held accountable those that executed its tenants — we need to do the same today with militant Islam. That is the only way in my view to ‘kill’ this odious, evil philosophy and the pathetic malcontents who carry out its ‘ideals.’ I have an article that I wrote and posted on this blog back in 2015, “We Need A Judgment At Raqqa,” a take on the Hollywood film classic, Judgment At Nuremberg,” which is available on this blog, if you would like to read more. With that……. The story reported on a recent study by the Center for Strategic and International Studies (CSIS), a pillar of the American foreign policy establishment. CSIS concluded that the number of Islamist militants operating around the globe is nearly four times what it was when the U.S. government began fighting them in the aftermath of September 11, 2001. Despite a cost of nearly $6 trillion dollars and the loss of nearly 7,000 U.S. military service members, the war on terror has clearly failed.